ORLANDO, Fla. – Hundreds of family members, civic leaders and community partners gathered at the Clarion Inn in Orlando to bid farewell to more than 200 Army Reserve Soldiers from the 143d Sustainment Command (Expeditionary) during a deployment ceremony conducted Feb. 24, 2018. The ceremony honored the men and women of Headquarters & Headquarters Company, 143d ESC, who volunteered to leave their friends and loved ones to join the thousands and men and women supporting three peacekeeping operations in Central Asia. Although their deployment will not officially begin until the Soldiers board a plane bound for their pre-mobilization site, Kotulich recognized the precious time her Soldiers sacrificed to prepare for the year-long journey. 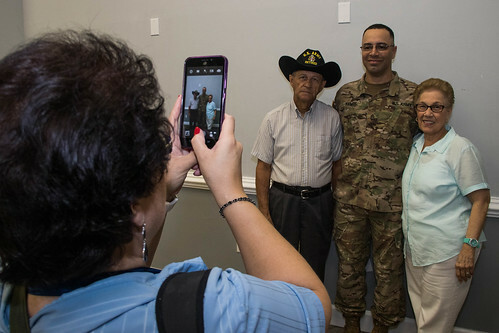 To better provide a proper sendoff of ceremonial proportions, the 143d ESC turned to several community organizations who always stand ready to support America’s service members. Volunteers from United States Overseas Central Florida served cakes and refreshments, while the Veterans of Foreign Wars Post 2093 Community Band played popular patriotic tunes. The formation’s dismissal signaled the Soldiers’ to find their friends and loved ones huddled throughout the ballroom. As parents, spouses and children embraced their Soldier one last time, Kotulich recognized the many sacrifices that will soon settle on those who must remain on the homefront.